A woman came up to our MLB.com/stlcardinals.com booth and said proudly, "Look what I have." She pulled out one of the most beautiful pieces of memorabilia from this event. It was a 2-by-3-foot color print of Adam Wainwright and Yadier Molina about to meet in a clinch hug near the mound. There was a signature from each player collected on Monday here, written over the home-white uniforms. It spoke volumes about the big machine that is baseball — it just keeps rolling and producing unexpected images like this each year. Wainwright and Molina. Who would have thought? "I am in Oklahoma literally iced in. Thank goodness we still have power so I can use my computer and read all about MY CARDINALS. I hope everyone attending the Winter Warm Up is having a wonderful time. The Cardinals will do it again this year. We have character, class and the talent to endure the long hard season. GO REDBIRDS!" – Kermit from Bartlesville, Okla.
"4 Winter Warm Up passes for my family $130. Hotel reservations, $300. Items to get autographed, $100…Not having a wreck on the way to St. Louis and injuring my family, PRICELESS! We had everything set but couldn’t make it to the Warm Up due to the weather. I am glad to see that everyone else had a great time. Go Cards!" – Dale from Jonesboro, Ark. I wonder if any fans are still waiting around the Millennium for Scott Spiezio. I don’t know about you, but I mainly wanted to see if he had shaved the red soul patch. David Eckstein kind of owned this weekend, with the possible exception of Tony La Russa. First of all, Eck signed autographs virtually the entire day on Saturday, stunning onlookers. Secondly, he received a standing ovation from the Fox Theatre crowd when La Russa introduced him in the front row at Tony’s "Stars to the Rescue" bash late that night. And then later during the Warmup, Eck’s family was on stage talking about the new book "Have Heart." Having said all that, the Shriek Meter officially recorded Albert Pujols as the annual winner. I wish I had taken a video of the reaction when he stepped through the curtains and took his autograph seat. No matter what, he’s still the rock star. And it’s worth noting what La Russa said Saturday night during that Fox event: Pujols went from his signing to get a plane full of goodies sent to the Dominican Republic for his ceaseless Pujols Foundation work. That was the side of Pujols most people would not typically be seeing on that same autograph day. 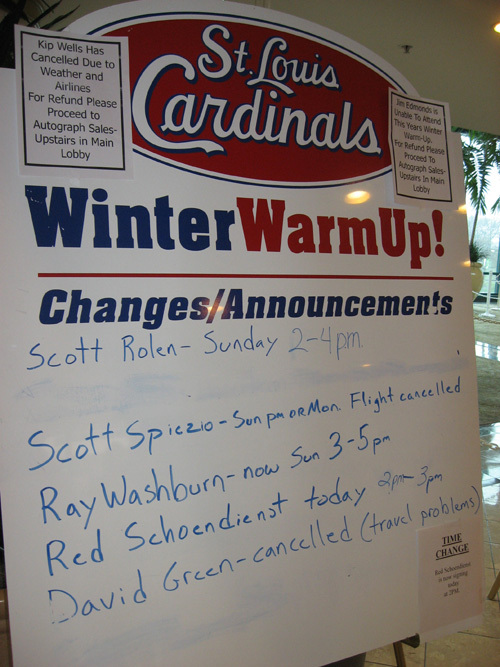 Red Schoendienst and Marty Marion signed autographs for a long line of fans this weekend. It seems like just six decades or so ago they were turning two. That’s the Winter Warmup. The kid who played runescape on one of our computers almost all weekend probably misses the Winter Warmup the most. I won’t have to tell him anymore that he has to let someone else use the computer in five minutes. I think it’s cool that his parents got him to come here, but MLB.com computers mean baseball has to be shared. Our booth is always a popular kid hangout. Will there be computers on Busch Stadium seats someday for this generation? The best was saved for last. 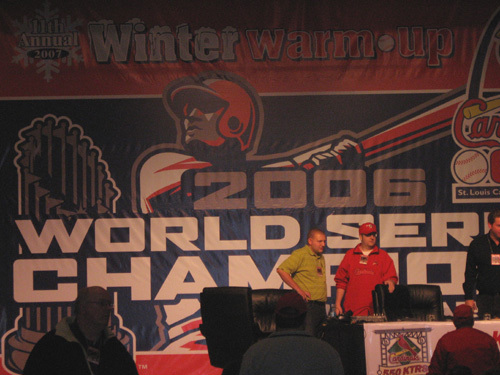 After the event, in the same ballroom, Commissioner Bud Selig revealed that the 2009 All-Star Game will be played at Busch Stadium. The only way this weekend could have been more perfect for Cardinal fans would have been for hundreds of thousands of homes in the region to have actually had power. It will all come back, just like baseball. Over at the MLB.com/stlcardinals.com booth, editorial producer Dan Hanzus and I have enjoyed the wintry return to baseball fever. For everyone who asks this question all day long: T-shirts are given out if you correctly shout out an answer in the Redbird Trivia contests we are showing on the giant plasma screen. The contests are typically whenever there is no activity on the main stage. Otherwise, we’re just tossing them out. Come by and get one if there are any left during the final day at the event, which ends at 3 p.m. CT on Monday. Mostly, we are showing constant replays of the last World Series as well as the last inning of Game 7 of the NLCS. …and at night, it was something you had to see to believe. I just got back from the "Stars to the Rescue" benefit concert from 6-11 pm CT at the Fox Theatre on Grand, where large sums were raised for Tony’s Animal Rescue Foundation (ARF). – Tony jamming on the drums during "Takin’ It To The Streets" with an "All-Star Band" featuring a reunion of Doobie Brothers Michael McDonald and Tom Johnston. They performed the classics, and as the final act of the night, Tony got in the middle of those two legends for a rather historic photo. – Wynonna. That’s all. Wynonna. She bantered back and forth with the crowd all night a la Bette Midler in "The Rose." She wouldn’t pull out her old stuff despite every "Grandpa" chant. She wowed the crowd with some soulfoul numbers. As with all the artists who appeared, she was there on her own and as a big-time ARF supporter. – Same with Trace Adkins, whose session included the same "Swing" track that was premiered this past year on MLB.com. Same with comedian/actor Kevin Pollack ("A Few Good Men"). Same with the opening act, the "Liverpool Legends." – Two video presentations of the last Cardinals postseason — one during the first half of the night featuring highlights through the pennant clincher, and one later in the night that captured the World Series. 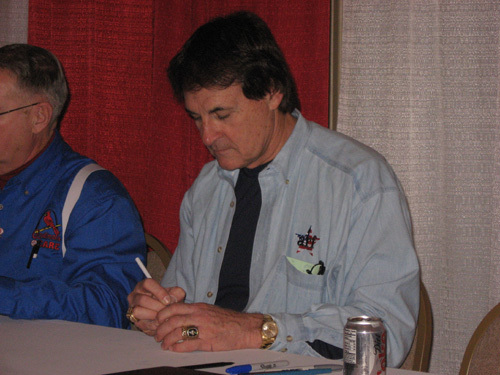 Here’s what La Russa told the crowd: The Baseball Writers Dinner on Monday night will be the "last time" everyone pats themselves on the back about 2006. Then he said, it’s all about 2007. You could tell from the crowd reaction that it was the right thing to say, but that there’s no way anyone is going to stop celebrating 2006 for a long, long time. They’re doing it now. David Eckstein, the World Series MVP, started signing autographs at 1 p.m. Others came and went in the meantime, on schedule. Eckstein is still here. It is about 5 p.m. A Winter Warmup volunteer just told me: "That’s just David. He won’t stop signing until everyone has gone. Last year he stayed until 6 p.m. until the line was gone. And he doesn’t just sign. He signs everyone perfectly." That was a great thing to see. That was good for baseball. The loudest reaction at the Winter Warmup so far came when Albert Pujols stepped through the red-and-white curtains and sat down for his autograph session. Major shouts and screams of wintertime joy. 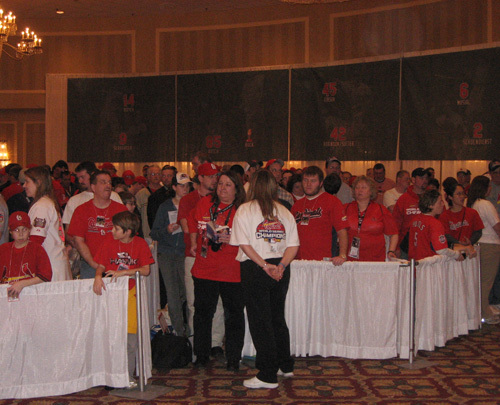 Congrats to anyone who got a scratcher ticket for a Pujols autograph — that, not surprisingly, continues to be the most-demanded line at this event. David Eckstein was a big draw today as well. The most interesting thing I heard today was Eckstein telling the crowd that he gave his World Series MVP yellow Corvette to his brother. Eck said he can’t drive a stick, and he said he still is looking for a new car. He also indicated that it might have been too fast. ld Series over and over on our giant plasma screen TV, while hundreds stand beside it in line for player/legend autographs. Everyone wants to see Adam Wainwright strike out Brandon Inge again. That’s it. And some NLCS Game 7. Please stop by if you’re here, just like these fans above did. Let me introduce the only apparent Cardinal Fan triplets at the Winter Warmup. From left to right: Maggie, Abby and Emily Scully from Dana, Ind. That’s their grandma, Carol Sparks of nearby O’Fallon behind them. We’ve been giving away T-shirts all day and will be doing the same Sunday and Monday. Fortunately the ice wasn’t that bad. Obviously no fan stayed at home. This place is very red and very festive. It feels like Parade II. Welcome to the Winter Warmup! We’ve got some icy conditions in downtown St. Louis this weekend, but that’s why the Cardinals Winter Warmup was invented. It’s the annual time when Redbirds fans from all over fill up the Millennium Hotel for their chance to live and breathe Cards Baseball again. If you’ve never been to one of these, then it is truly a sight to behold. And this time, they’re all here looking at a humongous main-stage sign that proclaims World Champions. Welcome to the stlcardinals.com booth, where you can find your free T-shirt! All you have to do is shout out the correct answers in the Redbirds Trivia contest that is ongoing throughout the weekend. Surf the computers that we’ve provided for fans, and get to know stlcardinals.com even better. Look for desirable 2006 Busch tickets while you’re here. Hosting the stlcardinals.com booth at least for the first couple of days is Mark Newman, Enterprise Editor for Major League Baseball Advanced Media. A former St. Louisan now based in New York City, Mark was last in town for a Game 5 clincher and an unforgettable Sunday parade. He also maintained the MLB.com World Series Blog last fall. You might find our own Matthew Leach, the Cardinals beat writer for MLB.com, around the booth during the three days as well. Step right up, have lots of fun, and by all means leave your comments below here on the World Champions Guestbook. It’s your chance to tell others what it’s like being at the (sold-out) Winter Warmup, and to leave congrats for the Redbirds if you’d like. laurelrp@charter.net on Welcome to the Winter Warmup! dcase@nettletonschools.net on Welcome to the Winter Warmup! mlkt@sbcglobal.net on Welcome to the Winter Warmup!